It's that time of year again, when we all get a cold and sore throat! 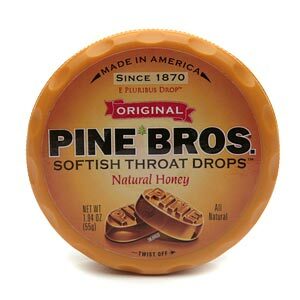 That's where Pine Bros comes in, because they have the most amazing throat drops! Offered in several flavors, you are sure to find one that's yummy for you. I had a cold the other week, and my throat was very hoarse and dry. These throat drops really coated my throat and soothed it instantly. It was great! I am a baby whenever I have a sore throat, it's the one thing I can't stand about being sick. So these were great for me. "Ulysses S. Grant was President and the population of America hovered at 39 million, when in 1870 J. Herman Pine hung out a confectionery shingle on 8th Street above Walnut in Philadelphia, and sold his first batch of what he called ‘Pine Brothers Glycerine Tablets.’ In an attempt to relieve his own sore throat, Mr. Pine, a former German confectionery maker, combined the soothing natural qualities of plant glycerin with the healing properties of gum acacia into one softish drop. By doing so, he discovered that he had created a product that could sooth and mitigate the mild discomfort of a sore throat. Add in some natural flavoring and sweetener and Pine Brothers Softish Throat Drops were born. “I have discovered something,” Pine wrote, “which will give quick throat relief to thousands afflicted as I was.” He added,”Perhaps I won’t make much money out of this. But I can make people happy, and that’s more important than money.” Mr. Pine was being unduly modest, as his “discovery” would become one of the most effective, most delicious and most unique throat lozenges in the world. Nor has the recipe changed appreciably since it was first introduced to the public over 140 years ago." 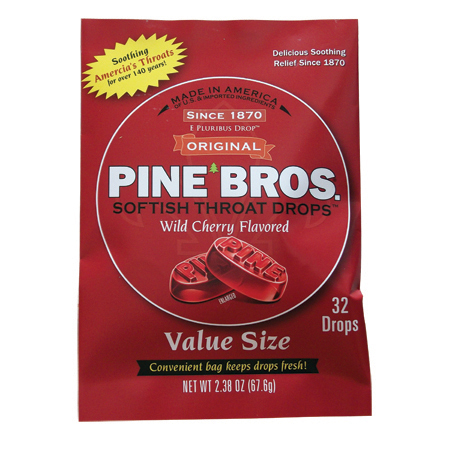 I love that Pine Bros offers a throat drop that isn't hard, sometimes when I have a hard cough drop in my mouth it scratches the roof of my mouth as it starts to melt and that's the last thing I want when I'm already not feeling well from a sore throat at all! Their throat drops are more like a hard gummy, soft yet firm, and melts in your mouth smoothly. Flavor is great! Tastes like you are sucking on some candy and not medicine. That's a good thing because I can't stand that "medicine taste". They come in bags as well as tins or "pucks", that fit conveniently in your purse or glove compartment. I cannot say enough about Pine Bros except THANK YOU for helping me feel better when I was sick. The kind folks over at Pine Bros are offering a giveaway to one lucky winner! The winner will receive some Pine Bros throat drops for themselves! I would love to try the Natural Honey.